For over 30 years, City Express has been providing top quality services throughout major cities, stretching from Singapore to as far as Hat Yai, making them pioneers in the industry today. They also provide daily trips between Singapore and Kuala Lumpur, Melaka, Johor Bahru and more. 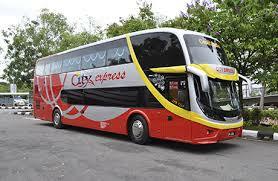 With different types of coaches available, coupled with well-trained staffs and drivers, City Express is able to a provide safe, comfortable and reliable services to the customers. Apart from a comprehensive route coverage and well-maintained buses, City Express services include various tour packages as well as express and charter coaches diversifying their business beyond mere express bus services. Furthermore, City Express also specialises in organizing commercial and incentive tours customized towards individual customer’s need at competitive rates. CatchThatBus offers online bus tickets to many routes covered by City Express (Utara) as well as seat availability features. You can book your bus ticket online from our website or via mobile app which can be downloaded for free on Google Play or App Store.